Lucky Louis is a new gambling operator licensed and regulated by the Malta Gaming Authority. The casino is mobile friendly and offers members the possibility of playing hundreds of games. It is operated by SkillOnNet and runs on software provided by some of the leading developers of online casino games. LuckyLouis slots are at the cornerstone of the impressive collection of games that includes table games, video pokers, scratch cards and other genres. What defines their lineup of games is diversity and their more than 700 titles are intuitively grouped based on genre. The upside of working with several leading software developers is that players can make the transition from one genre to the other and expect the same fine visuals and high return to player. Fans of Lucky Louis roulette will be happy to discover that their favorite game comes in several flavors. In addition to classic American and European roulette, players can experience the thrills of French Roulette Pro. The same variety of blackjack and baccarat games can be expected, and members can play European Blackjack Turbo as well as Punto Banco on mobile devices. Aces & Faces, Joker Poker, Deuces Wild and several other varieties of video pokers inspired by them can be enjoyed here. Lucky Louis scratch cards provide the much-needed variety for those who seek something different. Arguably the most popular games are progressive jackpot slots, which can make players rich virtually overnight. Some Lucky Louis jackpot games have the prizes pooled with other casinos, while others are won locally, so players can make an educated decision. The Lucky Louis bonus for new players is offered in an original manner. Instead of having the deposits matched by a cash prize, players receive up to 100 super spins when they load their account for the first time. 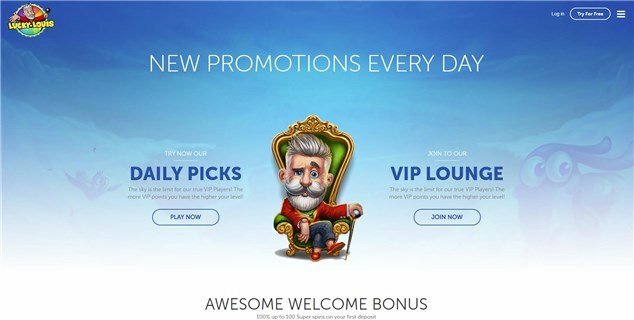 The process is straightforward and players can collect the Lucky Louis welcome package in a matter of minutes after setting up a real money account. The first step is to make a deposit of at least €10 or currency equivalent. In exchange, the casino will reward players with 10 free spins which can be used on the popular Rainbow Ryan video slot. These bonus rounds have a standard spin value of 0.5 and the standard wagering and Max bet rules apply. Players can significantly increase the number of Lucky Louis free spins by depositing more. To enjoy the best return on investment players would have to commit €100 to receive 100 super spins. This Lucky Louis online casino review will also shed some light on the range of promotions available here and the best way to claim them. VIP points are accumulated whenever players bet real cash on any of the games available. VIP loyalty points will be removed from the accounts of inactive players, so make sure you play real money games at least once every 30 days. The number of points earned increases as players move up the loyalty ladder, so perseverance is lavishly rewarded. Lucky Louis daily picks are offered to those who have amassed the highest number of VIP points. This means that players who have a high loyalty score reap bigger rewards that their counterparts. Bonuses become available all the time, so it pays off to be active and log into your account every day. These range from instant cash bonuses to more free spins so don’t waste time and play Lucky Louis games! The list of Lucky Louis payment methods includes popular credit and debit cards from MasterCard and visa. Players can also load their accounts instantly with e-wallets such as Skrill and cash outs take just a few banking days. All withdrawals are pending until midnight GMT, when the Accounts Department processes these transactions. Players have the option to cancel a withdrawal and use the funds to bet. To get in touch with the Lucky Louis customer support players can make a phone call, write an email or use the live chat. Assistance is offered by specialists in English, so interactions with the support team are smooth and useful. Players can seek answers themselves in the FAQ section. Online casino Lucky Louis offers games from software developers such as Amaya, NextGen, NetEnt, WMS and Evolution. 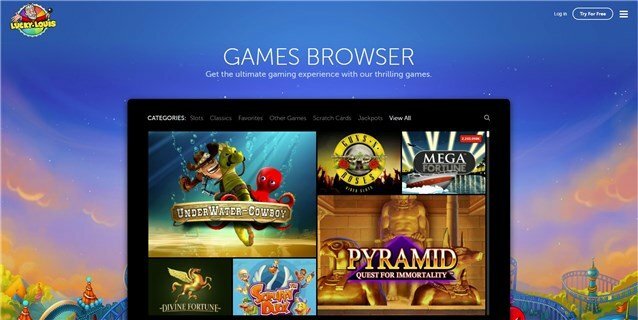 Players can expect to find here games from other producers of online casino games and enjoy them straight in the browser. The instant format makes it easier to launch the games without the need to download content before playing. Lucky Louis casino players can enjoy all these top real money games on mobile devices. That’s because smartphones and tablets powered by iOS and Android operating systems can be used for gambling purposes. The casino plans to launch a dedicated app for these gadgets in the foreseeable future. This will make gambling on mobile devices even smoother and likely drive up the number of active players. Lucky Louis takes security seriously and that’s why it uses the 128 bit SSL encryption technology to protect sensitive data. Players need not worry about breaches, since cyber criminals and wrongdoers in general are deterred by these defensive mechanisms. Their gaming system is also certified in accord with the conditions set out by the licensing body that oversees the operations. Private information about customers and data is stored securely and never shared with third parties. Players who want to open a new account can join for free by choosing a username and email address. The process takes less than one minute and players are also expected to create a password. There is little information about users is expected up front, with the name, country of residence and address being sufficient. When players feel comfortable making the deposit, they can select the payment method from the list of financial instruments available. Lucky Louis is a beautiful new casino from Skill-On-Net and a great choice for those who enjoy gambling on mobile devices. It has a great welcome bonus that rewards up to 100 Super Spins and ongoing promotions for dedicated players. Its payment methods are fast, reliable and customer support offers assistance round-the-clock. The bottom line is that players have plenty of good reasons to register and claim their bonus today! - Lucky Louis online casinos has more than 700 mobile friendly games to offer. - The website is beautiful, easy to navigate and loads quickly on smartphones and tablets. - Generous Lucky Louis welcome bonuses and promotions keep players motivated and excited. - Lucky Louis could benefit from the addition of live dealer table games.